Leuven, Belgium’s oldest Botanic Garden. ← Using Colour in my Garden. Leuven is an historic and pretty Flemish town, 25km east of Brussels. 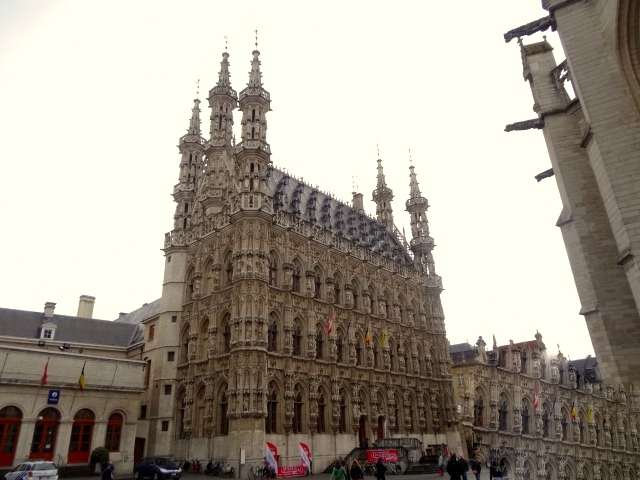 The 15th century late Gothic Stadhuis/Town Hall in the square in Leuven. The central square a favourite place for us to sip coffee or a cold beer. Springtime in the Fruit Garden, Botanic Garden, Leuven. But it was only this year that we made our way to its Botanic Garden/Kruidtuin (herb garden) and what a treat was in store. The Hortus Botanicus Lovaniensis is the oldest Botanic Garden in Belgium, originally laid out by the University for the study of medicinal herbs in 1738. Late Spring is a wonderful time to visit when the spectacular wisteria clothes the walls of the Orangery in lavender hues. The scent is pervasive, almost overwhelming. The green stripes of the manicured lawns are edged with wisteria “trees” too, late-flowering ones so the display lasts right into June. Although not large, the standard of maintenance is excellent and there are many smaller gardens to retreat to with really well-thought out seating areas, and I could imagine whiling away the hours with a good book or daydreaming to the sound of the dripping water from languid fountains. 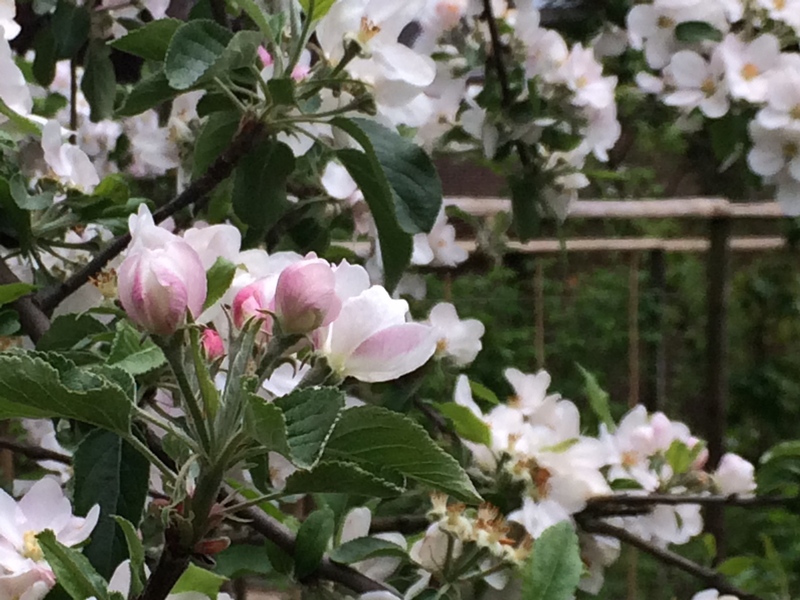 The fruit garden in Spring is full of blossom and the hum of bees, who retreat to their hives in a corner of the garden. 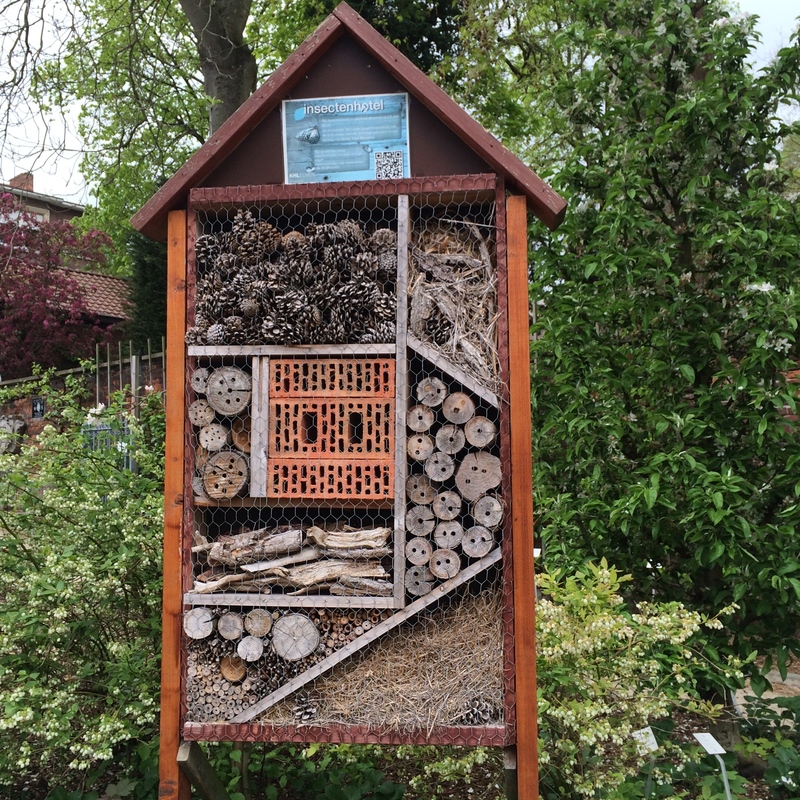 Concern for pollinators is clear with a large Insect Hotel, and plants which promise a long season of nectar. 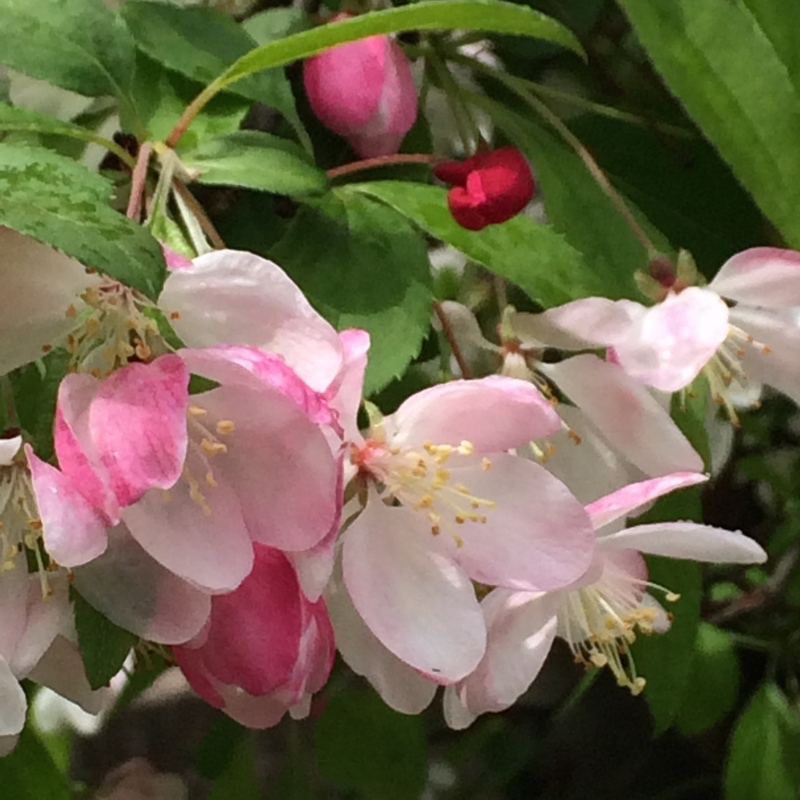 Meandering paths lead through scented shrubs, all well labelled, down to a pond and into an area of woodland planting. 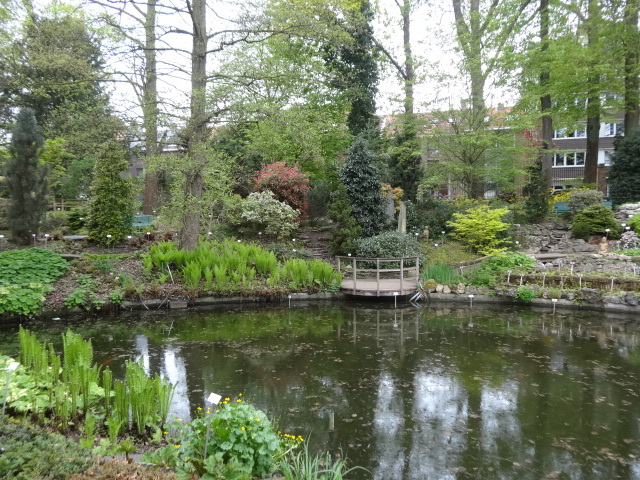 The pond and woodland area. 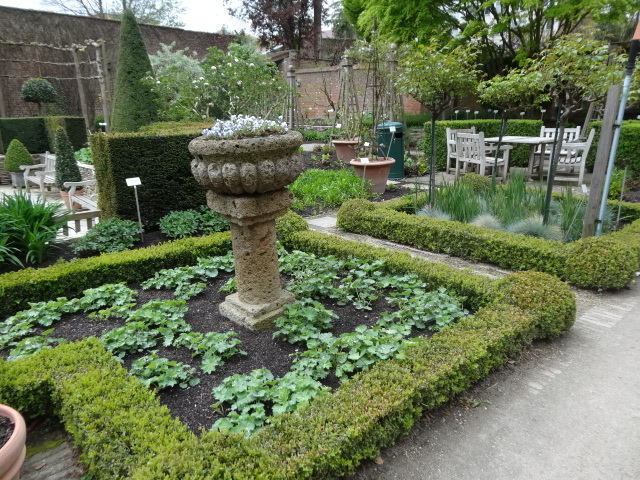 This is a lovely Botanic garden – small, sweet and welcoming, in a very beautiful Flemish town. And, even better, entrance is free. Oooh, the wisteria! I’ve never seen it like that. Love the feminine statue as well– stuck in a lovely garden– that’s about the best place I can think of to rest. Thanks for sharing. 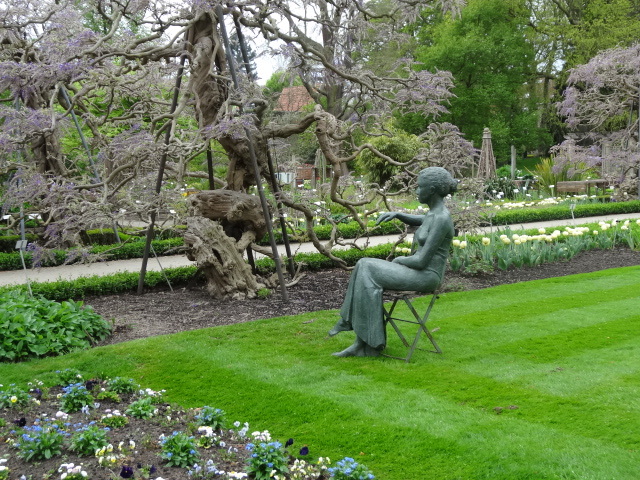 Thanks Julie, the wisteria was truly spectacular and I too loved the seated lady statue elegantly poised. A gorgeous garden. The wisteria was spectacular. Yes a lovely garden and an unexpected pleasure to discover it in this beautiful town. great garden !!!! thanks for the tip ! Hope you get a chance to visit it. Leuven/Louvain has so much to offer. I’ll certainly keep it in mind ! Lovely. A Belgian city I haven’t visited since I was a student. Now I have a good excuse to go back! 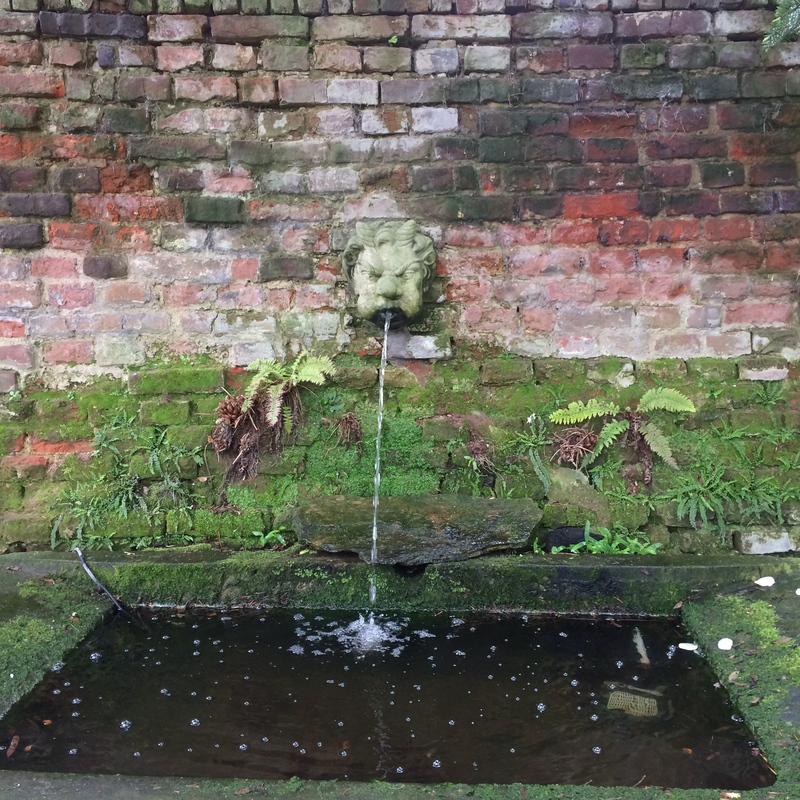 I love Leuven/Louvain – our Belgian house is 20 minutes away but we invariably head into Brussels – so I have only discovered the Botanic Garden and the incredible medieval Béguinage in this last year. Worth a visit I think! Lucky you. We love Belgium and really hope that one day the ferry service between Ramsgate and Ostend is reinstated. We liked our little jaunts over to Bruges and Ghent but now they take so much longer. Antwerp is another city I’d like to go back to. So much to do, so little time!! This is so lovely. I have been thinking it is time to visit a friend outside of Paris…was thinking where else we might go! I am putting this on the list! Thank you for sharing…the pictures are wonderful. Laurin, glad you enjoyed the post. A sight for sore eyes. Thank you again. 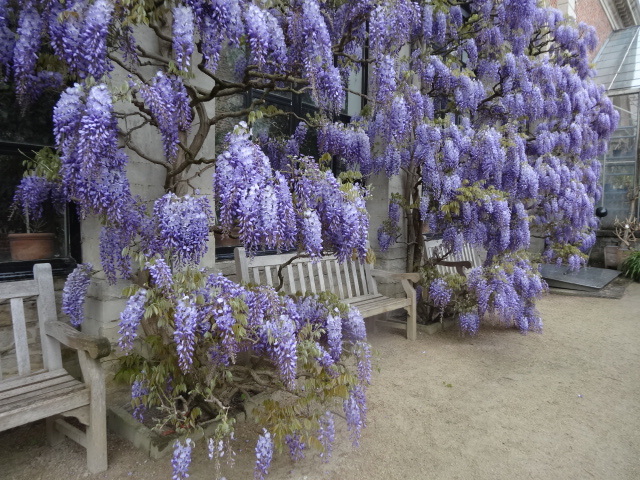 And that wisteria – my goodness. I wish mine were more cooperative.